14 points why light bulb ban arguments don’t hold up. It is rather odd to justify a ban merely on supposed consumer savings – Johnny Citizen can presumably judge himself what product he wants. – and are therefore ignored. I think most of the arguments on the freedomlightbulb site are bogus. First, of all, choosing the incandescent bulb as an icon of freedom or efficiency is like choosing the donkey as an icon of modern transportation. They’re fragile, short-lived, hot (usually a drawback), inflexible as to placement, and too inefficient to run on batteries, to name a few drawbacks. The light is full spectrum, but it’s actually comparatively crappy because the color temperature is way too warm. 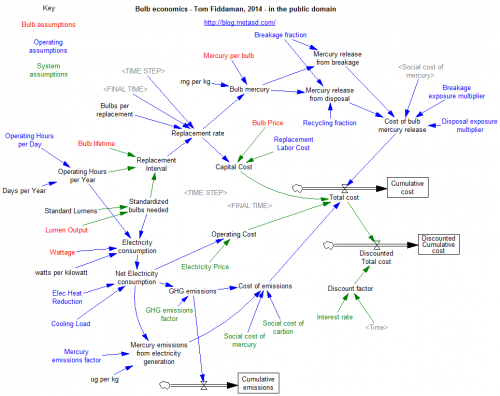 The evidence against rational consumers is pretty overwhelming in all domains, not only energy. The cost accounting in #4 is silly, and It’s downhill from there, particularly “the same coal gets burned regardless of whether your light bulb is on or off.” #9 (internalization of heat) crosses the line into the physics of a counterfactual universe. Perhaps I’ve given the wrong impression here, but the only compelling argument against a bulb ban is that it’s an inefficient and inflexible policy when compared to pricing emissions and other externalities. Those Freedomlightbulb argument are correct, but perhaps not expressed well. Proportionally more heat from resistive simple incandescents is radiated externally. The complex CFLs and LEDs with internal ballasts and transformers retain heat in the circuits and have a greater fire risk from the bulbs themselves, particularly CFLs. As for same coal being burned, coal is uniquely a base loading source (too slow for peak loading at times of highest grid demand) . Most incandescent use is off-peak in the evenings and effectively covered by coal plant output levels as described, so the argument is valid enough. Your main argument seems to be that consumers are irrational in what they choose. But on Energy Star and other data most homes have different bulbs and had them before the ban. So people do not keep buying incandescent bulbs just because they are cheap, if not otherwise satisfactory. All light bulbs have advantages as the website says, with listed incandescent advantages, energy or money saving being just one advantage. I don’t really have any bulb preference but would certainly choose cheap incandescents especially for rarely used lamps. It is rather presumptive to say that people are stupid in their choices, and should be limited in what they can buy of safe-to-use products. Exactly. More relevant then is the big picture, to look at what power plant energy is used, to put a levy on coal etc if needed, rather than worry about what products people choose to buy and use. 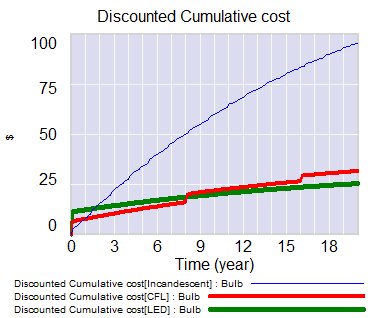 If targeting bulbs is still desirable the Freedomlightbulb site describes bulb taxation (which can subsidise a lower price on others) and market alternatives, if you read further down. It sounds like we more or less agree on ideal policy, differing on what to do in the second best case. But we disagree on physics apparently. All bulbs arrive at an equilibrium, in which heat transfer out balances heat generation. Otherwise the bulb’s temperature would increase. Therefore over any interesting time scale, all bulbs radiate 100% of their waste heat. The only sense in which proportionally more heat is radiated from incandescents is as a proportion of energy input, because they’re so much less efficient. The argument about coal is similarly specious. There are transient situations where electric power systems exhibit strange behaviors, like negative spot prices. But in the long run, the invisible hand works. Less evening lighting load means less baseload capital spinning and less coal into the burner.